Rosehips come from the fruit that is found at the base of wild roses. It is not uncommon for them to be used in jams, pies, and other culinary uses as well as teas. Rosehips are separate from the leaves or petals of the roses which are also used to make tea. 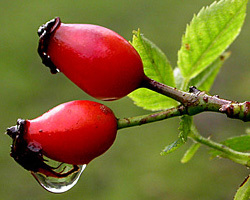 The main difference between them is that rosehip tea is uniquely high in vitamin C and other nutrients, which sets it apart from other rose tea counterparts. As a result, Native Americans and other natural herbalists have been using this plant as a natural remedy to fight off colds and flu for hundreds of years. However, one will find that many people who drink rosehips tea, drink it for the distinctive flavor rather than for the health benefits it has to offer. The taste of rosehips tea is undeniably tangy and somewhat sour, making it very similar to the tart taste of cranberries. The main reason for the sour, tangy flavor that comes with rosehips is because they are so high in Vitamin C. In fact, the concentration of vitamin C in this particular tea is even higher than the concentration of vitamin C that you can get out of eating citrus fruit. For this reason, it is good to drink during cold and flu seasons so you can build up immunity and prevent these particular sicknesses. Because it is also incredibly high in other nutrients and antioxidants, it can help keep your body cleansed and healthy. 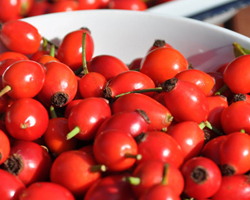 Rosehips contain pectin which aid in digestion by slowing the absorption of glucose. If you are suffering from diarrhea, urinary infection, or constipation, drinking this tea is beneficial for all of these problems. This is because it helps to balance out the digestive system, making sure that everything in your system gets back to working properly and efficiently. Rich in iron, rosehips tea can help ease the symptoms of anemia and is a particularly useful tea for pregnant women to drink because their needs for iron are doubled during this time. Some studies suggest that rosehips can also be a useful antidepressant, fighting seasonal affective disorder and other side effects of depression. 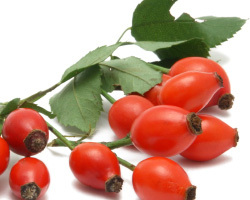 All of these health benefits are only the tip of the iceberg; as it seems with every study that is conducted scientists learn more and more about the benefits of the rosehip. Even more benefits of rosehips tea include their ability to prevent bladder infections, ease dizziness, and reduce the pain of headaches. They are rich in vitamins A, D, and E, and are full of antioxidants that help combat free radicals in the body, reducing the risk of cancer. The high dosage of vitamin C means that the rosehips can help to calm the heart, dry up mucus, clear sinus infections, and eliminate coughs or congestion. They also have a high percentage of lycopene, which is a compound usually found in tomatoes. This helps reduce your risk of certain types of cancer, particularly of the prostate. Like with many other teas, rosehips tea can be drank either hot or cold according to preference. To prepare it, simply take one bag and steep it in hot water for 10 to 15 minutes. It is generally more tasteful to sweeten this particular tea with honey rather than sugar. You can drink 3-4 cups of rosehips tea a day as necessary or as preferred. Rosehips tea is a flavorful drink that can be enjoyed at any time. You will take comfort and be happy knowing that you can drink something that is not only good to the taste, but beneficial to your health as well. If you’ve taken an interest in trying rosehips tea, you can most likely find it available for purchase at any local health food store in your area. If not you can still certainly find it available for sale online from reliable merchants like Buddha Teas. We hope that you’ve found this article informational and left you with a desire to at least give this wonderfully healthy tea a try. If you still hold any lingering questions, please feel free to contact us and let us know. For those that are looking for a tea that is not only healthy but favorable in taste as well rosehips tea may be the perfect choice. 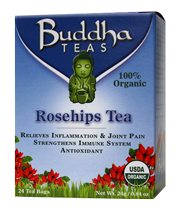 Rosehips tea has a distinct and savory flavor as well as a wide variety of great health benefits. 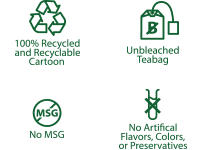 Learn more about the great advantages of this wonderful tea.